Keeping tabs on your body fat percentage is an important part of getting the most out of your training and dieting, as body weight alone doesn’t tell the whole story. The problem, however, is that most inexpensive, easily available devices for measuring body fat are horribly inaccurate. Hand-held electrical devices are notoriously unreliable, as are scales that “measure” body fat levels. Taking measurements and entering them into an online body fat percentage calculator of some kind can give some wildly incorrect results. Most experts agree that hydrostatic testing, DEXA x-ray, and BodPod testing are the most accurate methods of testing body fat percentage. The downside, however, is the inconvenience and cost of these methods. 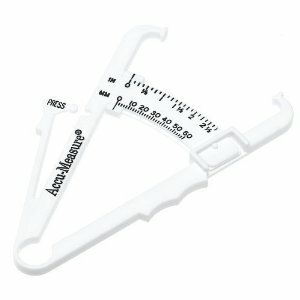 Therefore, I recommend that you get a good fat caliper like the AccuMeasure Fitness 3000 Personal Body Fat Tester Kit. When you learn how to test properly with this simple device, you will get very accurate measurements (within 1%). If you follow the simple directions that comes with the device, you’ll have no problem taking quick, accurate measurements of your body fat percentage, and you can’t beat the price.